In Ludus we are trying to make the code completely modular, so all the systems exist on their own with as few dependencies as possible. The systems fetch all their information from the world, process it, and then put the information back into the world instead of sending information around to different systems. We don’t have too many things in the architecture that we are strict about but this part is important because we want to be able to replace and improve the systems independently without affecting too much of the code-base. The bigger the code base becomes and the more sub-systems that are put into the simulation, the more important it becomes to be able to work on something without breaking something else. It also helps make it easier to implement and debug just one aspect of the game, and also means by serializing just one class we can save and load everything we need simply by ‘saving the world’. -The characters in the world. -The relationship between those characters. -The upcoming set of gladiator games. -The active rumours in the world. It also has a bunch of helper methods to for example find a character with a certain profession or to get the asymmetrical relationship between two characters (I like you but you don’t necessarily like me). 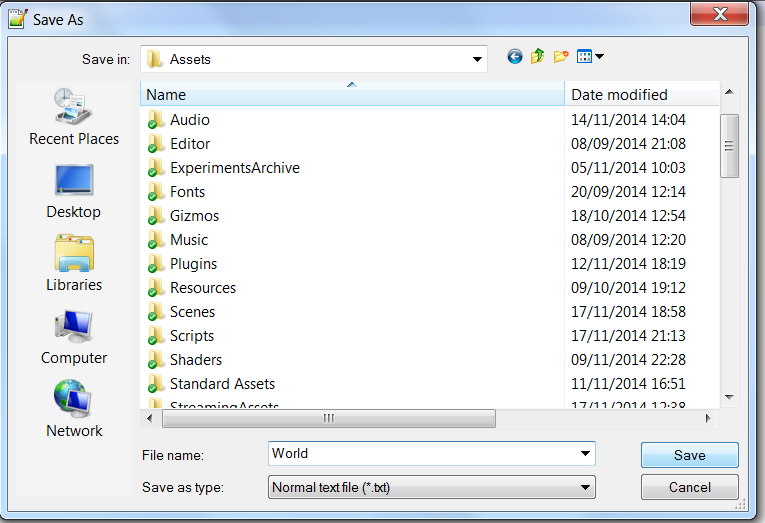 Almost all the characters in our game are generated at runtime and as I mentioned are stored as data in the world object. 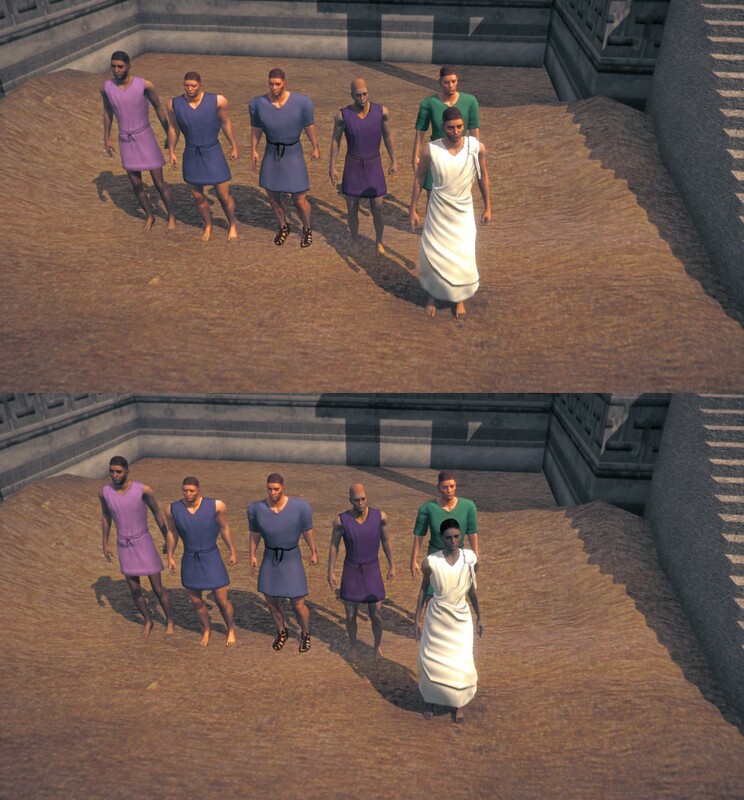 The world object is persistent between the scenes and so when we for example need to load the slave trader into the market scene, we first use a simple proxy object to place the character visually in the level editor. The proxy object has a little replacement script on it that finds the world object and requests any character in the world that fits the description, in this case: the occupation ‘slave trader’. The world object finds the most appropriate character or generates a new one with the required properties so the important professions will always available in the game. This is extra important because in our dynamically changing world with senators vying for position and fighting out personal vendettas, some of them have a tendency to lose their heads, both figuratively and literally. In other words, if something unfortunate has befallen Quintus the slave trader; Julia, whom just so happened to recently move here from Aegyptus, will be there to replace his function in the game. She may not be as friendly on the prices, but she’s got a keen eye for gladiator talent and you can start a brand new professional relationship with her. That’s a good thing because Quintus had been getting on your nerves and that was why you told everyone he was sleeping with the magistrate’s wife . Quintus position has become untenable and he gets replaced by the more favorable Julia. 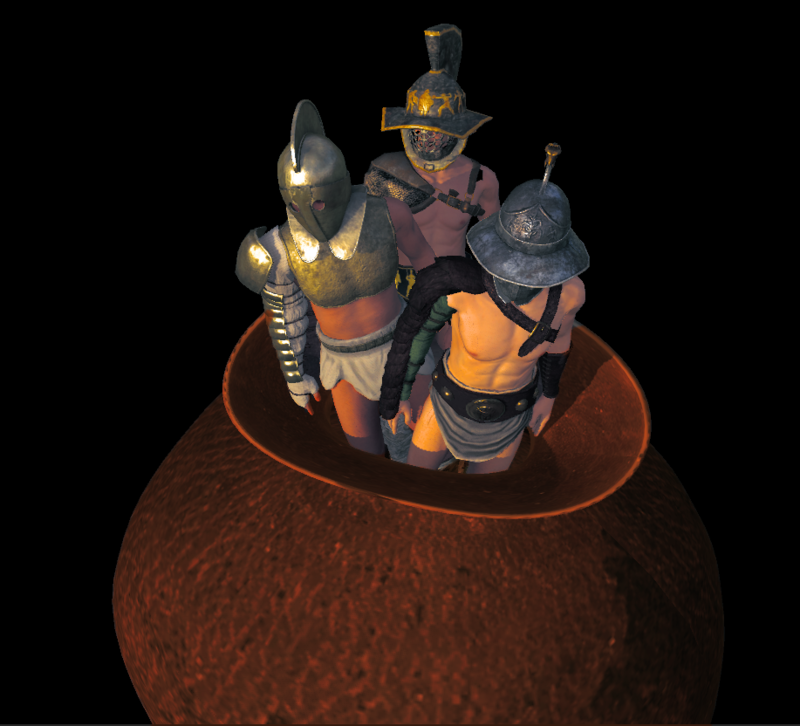 As you trade and talk with this new character, the state of your relationship is updated from the conversation system to and from the world object, but the character placement system only knows that there has to be a character in this 3D position with the occupation ‘slave trader’ and the corresponding conversation trigger on it. Upon realizing that I needed to store all the things in the world in some way, I adapted the already existing inventory system to use as a kind of world state for the prototype. Gradually I added more things and realized I needed to store arrays of characters in there. This lead to conceptually peculiar parts of the code-base like Inventory.AddSlave() and Inventory.GetCharacter(occupation as string). The principle of idea of the world object was good though, and it’s still called Inventory in the codebase. The trouble with rendering a lot of different looking characters is that they tend to require a lot of drawcalls. Normally when making a crowd, the way to do this is to combine several skinned meshes together into a single skinned mesh and then send this to the GPU as one mesh. For Ludus I wanted to draw a huge amount of characters in the crowd, with sufficient visual variety that they looked like a crowd of individuals as opposed to multiple copies. I also wanted to control their animation independently to display things like a mexican wave, and different other ‘multiple people doing the same thing’ type of motions. 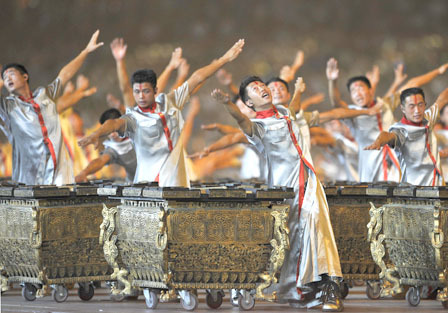 I was thinking a bit about the kind of motions that the chinese olympic opening ceremony showed so well with lots of people doing something with a slight delay to eachother, but almost completely in synch. For example everyone holding up a card at the same time, or doing some arbitrary motion. There’s something very appealing with those motions because as synched up as they are, they are also subtly offset because however trained they are, there are always some minor differences in reaction time etc. 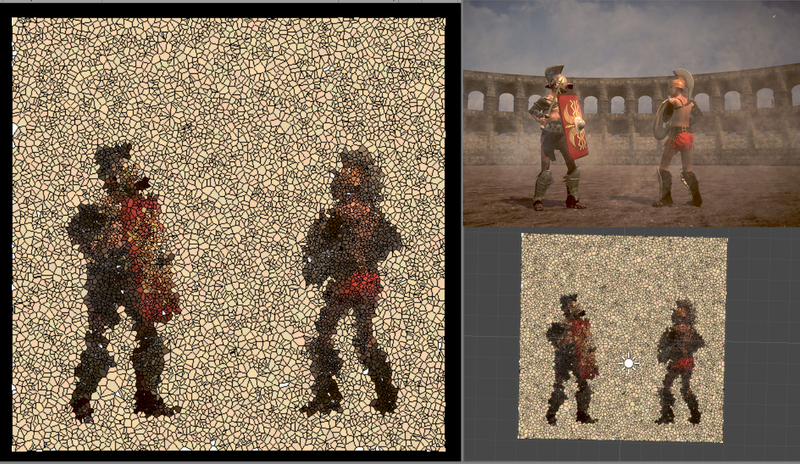 In order to do this I figured I needed to be able to control the animations of the characters individually, but still send it to the GPU in as few draw calls as possible. Unity will try to dynamically batch any unskinned mesh together that is less than 900 vectors of complexity, including UV coordinates and normals. 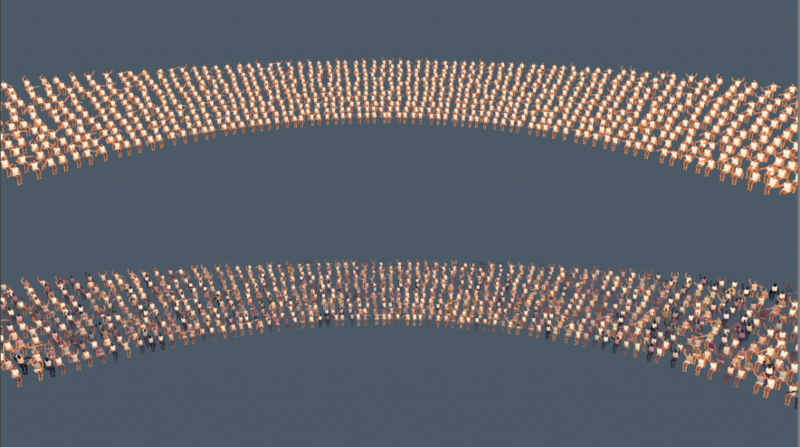 That leaves us with a budget of around 300 vertices + 300 uv coordinates + 300 normals. To achieve this while keeping the overall shape I first cut the body up into the major parts that I wanted to animate, used an automatic polygon reduction tool to hit the target vertex amount while maintaining the shape as much as possible. Now animating the mesh only using these major areas instead of a skinned mesh, I can get enough animation fidelity for the crowd agents without using bones at all. Since the crowd is far away, there’s no way of seeing the bad interesctions etc, so even though the model parts are completely rigid, we don’t really percieve it as wrong from the distance we see them at. Up close of course, the mesh is not sufficient, but as soon as it goes somewhat into the distance we stop paying attention to a lot of the details and start seeing the agents as a crowd. When we look at a large crowd, the thing that affects us the most in terms of perceiving the characters as a group of individuals as opposed to a group of copies is colour. Shape and animation are both secondary to this. We can easily see how big an impact this has on our perception by comparing the two images below. In order for dynamic batching to work in a complex scene we have to make the rendering instruction as simple as possible. 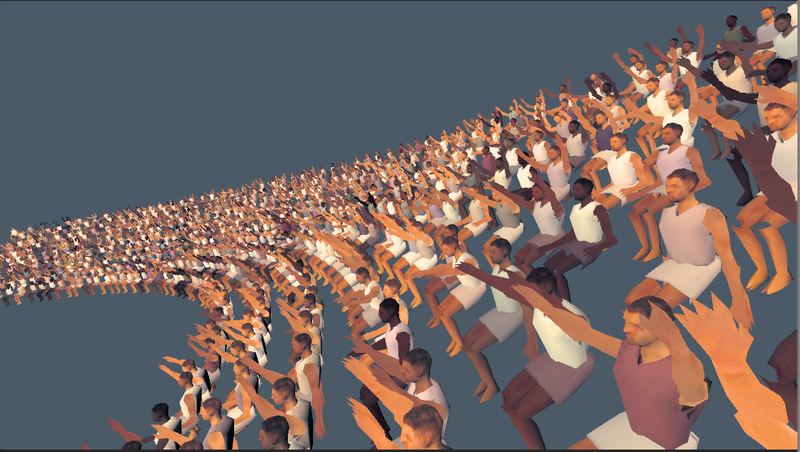 This means excluding the crowd from shadow computation, and basically using vertex colours as much as possible. 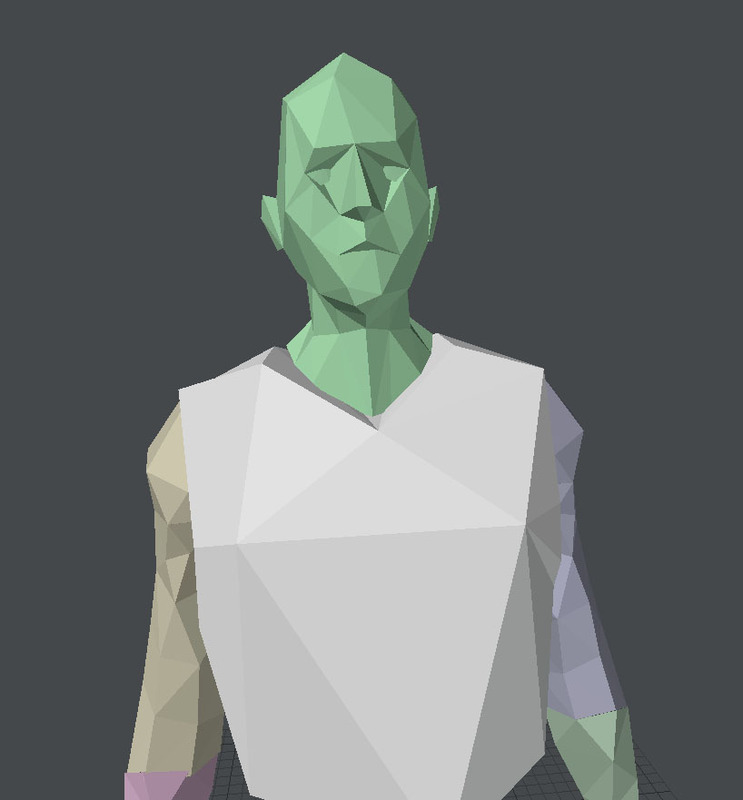 I wrote a simple unlit vertex colored shader, and then computed on the CPU the shading of the characters per vertex at spawn time. This way we don’t need to compute anything substantial on the GPU. not even a dot product. So each character is vertex coloured using a random skin tone and their rest value normal dot product to the light forward direction. This might seem strange as the characters move around their lighting is effectively baked in, but because of the distance and the multitude of characters, we don’t really perceive the ‘error’. 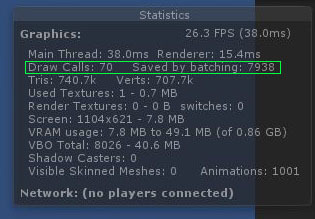 In the end we save a huge amount of drawcalls using the dynamic batching method and can still maintain individual agents for animation purposes, and have about as many of them as our CPU can handle. 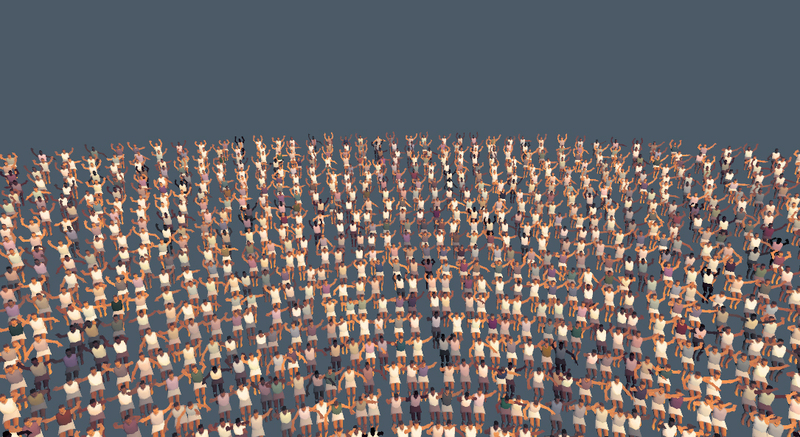 And here’s the final test from unity, 1200 individual crowd agents running in the editor on an Intel HD 4000 integrated graphics card. And there you have it, dynamic draw call batching for use in crowds. I’m a big fan of procedurally created or assisted artwork. It’s something that’s both kind of complicated to do and makes for some unique and interesting variations in a game. 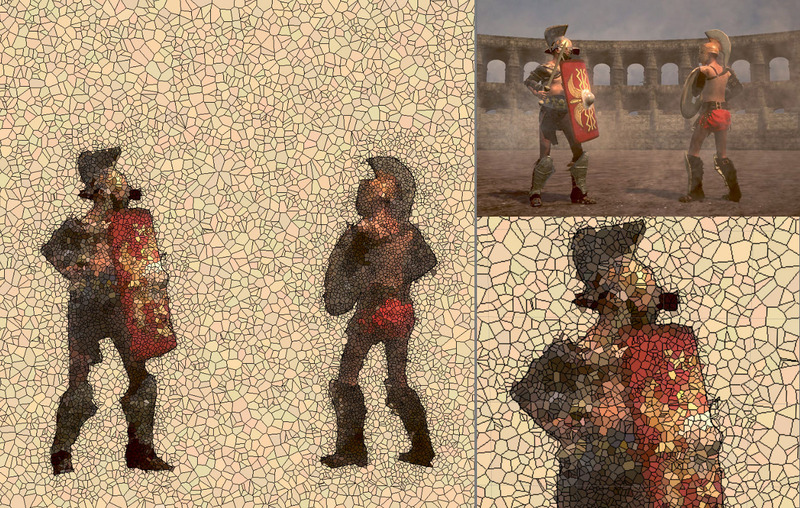 In Ludus I wanted to be able to produce a procedural mosaic and then link this to the Player’s story. The idea was that after a particularly exciting match, a local artist NPC might come to the Player and ask if the Player would like to commission a special mosaic to commemorate the fight. This kind of decoration can then be used to impress people that come to visit the Ludus and is visible in game. Now of course, this could have been just represented by some pre-made picture of two gladiators fighting, but I thought it would be much more interesting if it captured a real moment from the fight. So to do that, I decided the best way forward was to actually capture a frame from the 3d scene and see if I could get this to look like a mosaic. First I started by rendering just the characters and ignoring all the background layers with a special camera that is attached to the main camera into a texture. Since most of the mosaic backgrounds I found are just a single colour with some random variation, we don’t need any of that information. Then I tried doing a normal Voronoi diagram over this image. Just placing random points all over the size of the 2d texture, computing the Delaunay triangulation and drawing lines between each center point of the triangles. After the lines were in place I sampled the rendered texture we had from earlier at the vertex where the random point in the voronoi diagram was, and performed a flood fill from there. If there was no alpha value in the rendered image, I instead picked a random colour. This left a few areas unfilled because they happened to overlap with a vertex that had also been shaded as a line, but otherwise gave the impression I was looking for, so I just pre-filled the computed pixels with one of the same colours as I was using for the background. The effect wasn’t quite good enough, in particular I felt that the shape of the outline was a bit too blotchy compared with the real mosaics which usually have quite a strong outline, often re-inforced by an extra black line. 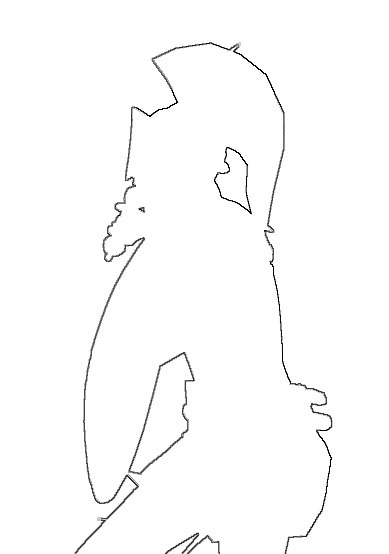 I decided that I needed to draw an outline of the characters, so this would always be clearer. To do this I sampled the alpha values of the rendered image, and whenever it changed from its neighbours, it would draw a black outline on this pixel. The second thing I noticed was that I needed more ’tiles’ in the internal shape of the characters but this was wasted if distributed evenly everywhere on the image. I decided to change the algorithm for the initial random points of the Voronoi diagram so that instead of being completely random, each pixel was scored randomly but the score would increase if the alpha value was over 0.5, which meant that there would be more random points inside of the character, and thus more tiles used. So there you have it, prodecural mosaic, or at least as far as I got with it before having to move on to something else. 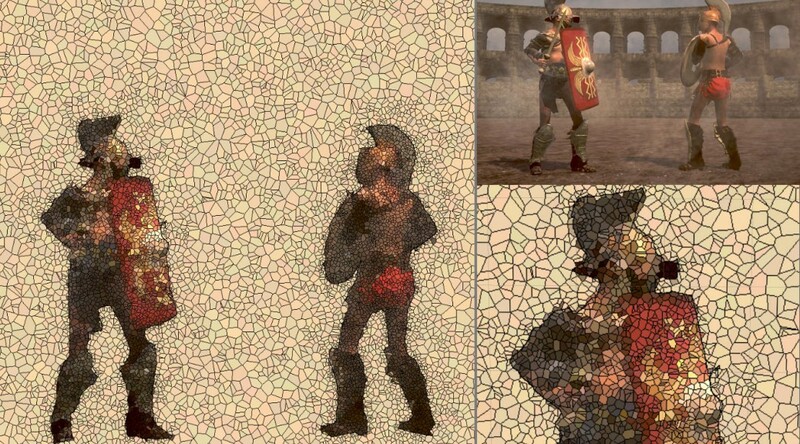 One of the things I think is interesting here to link it further to gameplay, is that for example if you decide to commission the artist to make the mosaic, but give him less money than necessary, he can produce a mosaic with fewer tiles, giving less visual fidelity to the action. During the Managerial & Role-playing phase, you have many options available to you, but only a limited amount of Action Points [AP]. You can upgrade your Ludus and the Arena, hire new staff and set out the training schedule of your gladiators. You may also choose to buy slaves at the market, buy new armour and weapons from the blacksmith, advertise your up-coming games to build hype, visit the bath-house for a chance of bumping into the upper echelons of society (and gain new patronage), visit the tavern to learn about rumours and place unsavoury bets, or carry out missions to gain the patronage of ambitious magistrates. Various events will take place in this phase where you have multiple options to choose from and that affect your social position, the gladiators, your Ludus, or even your personal character. The role-playing aspects of the game immerses you in the role of the gladiator manager, and provides you with a lot of options to fit your player style and helps you carve out your character’s vices and virtues. In The Games Resolution phase of the game, you take the role of the tactical coach, while the matches that you have set up for the current Games play out in the arena. 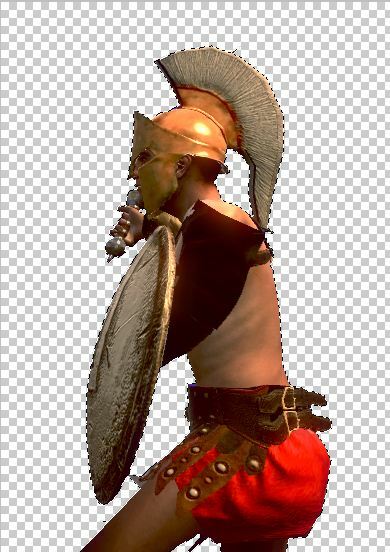 You shout instructions to your gladiators to change their stance or alter their attacking intensity. 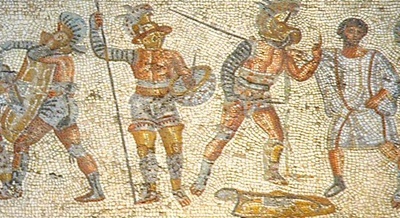 The gladiators attempt to follow your orders as best they can, though it is not always easy to get a new order across to a gladiator mid-fight when his leg has just taken a knock from a sledge hammer and his helmet is obscuring his vision and hearing. Your objective is to give the audience a great show whilst not killing off or heavily injuring too many of your gladiators. 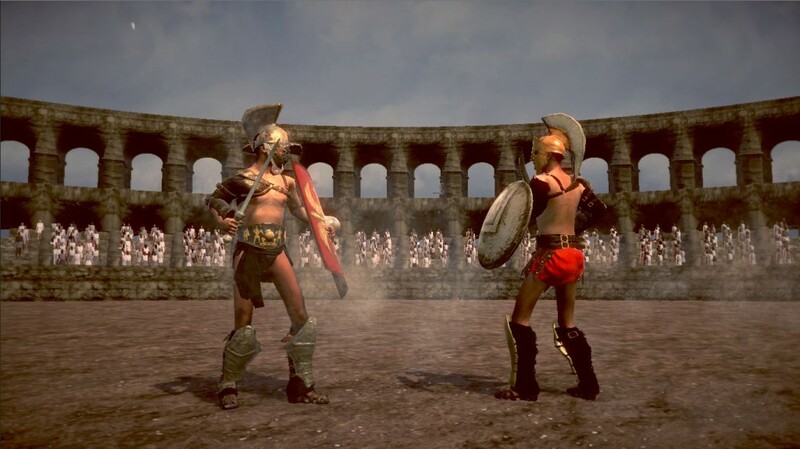 The gladiators play as either Heroes or Villains, and their aptitude for this is determined by their statistics as well as how you have kitted them out. It is not enough to just fight, the gladiators must excite their audience by doing so in an impressive manner. The excitement of the audience must at least match the hype that you have built up for the games for the audience not to go home unimpressed, and the Editor/Sponsor of the games being displeased with your show.